Perspective and a sense of depth are two factors that the human eye has come to expect when looking at figurative art (in other words, art that clearly depicts something realistic and not representational or abstract). When we see an illustration on a cereal box, a mural on the side of a building, or an 18th century painting in a picture frame on a gallery wall, we expect that image to appear – at least to some extent – three-dimensional. After all, we live in 3D and being confronted with something lacking in such depth can be startling. 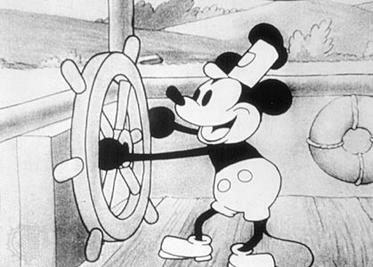 Even cartoons, a medium usually associated with flatness, utilise the tricks of perspective to build a sense of depth in the scene – this 1928 still from a Mickey Mouse film illustrates this point. Surprisingly, though, it wasn’t always this way. In fact, before the 14th century, artists didn’t tend to concern themselves with perspective and depth. It wasn’t until artists like Giotto and Duccio began to experiment with new techniques that figurative art began to resemble the paintings we know and love today. In the Byzantine, Medieval and Gothic periods, art was not about creating a realistic scene with a sense of depth and space – it was used to depict characters from religious or historic stories and legends, who were often set against plain or decorative backgrounds. The figures were the focus of these paintings, and thus, the surrounding details were of lesser importance. Take a look at the Bayeux Tapestry, for instance, and you’ll see that, while decorative details have been included, the figures and the text are the main focus. This, in essence, was an artwork created with a specific purpose – to record a story in detail. Perspective and depth were factors that began to creep into artworks as the stories and scenes depicted began to incorporate more human emotion. The record of the event was still important, but so was conveying a sense of how it felt to be there in the moment with these people. At the end of the 13th century and into the 14th century, artists such as Giotto and Duccio began to toy with perspective and depth. In this fresco, which has been attributed to Giotto, we can see how the figures have been shaped with light and shade, and arranged in front of one another to suggest a crowd. A similar attempt can be seen in this painting by Duccio, where the figures have been shaded and arranged to suggest that some are sitting in the foreground, lower and further forward than the others. Notably, however, none of the figures are casting a shadow on the ground; the lack of a background also flattens the image. If Giotto and Duccio began to lay the groundwork for perspective, it was Brunelleschi who made the definitive step forward. In 1415, he painted the Baptistry in Florence, utilising linear perspective and ‘vanishing points’ to convey a sense of space and depth. This style of painting quickly caught on, and was taken up by artists such as Masaccio, who became known for establishing Florentine Realism. In this painting by Masaccio, we see a huge leap forward from the works of Giotto and Duccio. The figures are all casting shadows, grounding them in the scene, and the trees, mountains and clouds suggest a great deal of space in the background. Most strikingly, the building to the right of the painting moves back at a realistic angle, making it seem like a space that the figures could actually turn and walk into. Over the next two centuries, the use of perspective became a vital element of painting. Renaissance artists such as Da Vinci, Michelangelo, Raphael, Botticelli and Titian drew on the perspective techniques first pioneered by Giotto, Brunelleschi and Masaccio to ground their scenes realistically, essentially ‘tricking’ the eye into seeing these flat images as three-dimensional. As a result, during this period, trompe-l’oeil painting became popular. This was painting that essentially operated as an optical illusion, forcing the perspective so that, when seen from the right angle, the image looked fully three-dimensional. In the San Pantalon church in Venice, a vast trompe-l’oeil ceiling painting by Gian Antonio Fumiani gives the effect of the building rearing up into the sky. The art world is always changing, and as a result perspective began to slide down the list of the painter’s priorities in the 19th and 20th centuries. Artists like Paul Cézanne and Pablo Picasso chose to move away from perspective, and instead began to focus on the way in which the human eye (and brain) truly perceived the world. These artists were the first to suggest that linear, realistic paintings did not necessarily chime with the human experience – by distorting perspective, depth and space they hoped to align their work with all that is fragmented, shifting and mercurial about our sensory experience of the world. 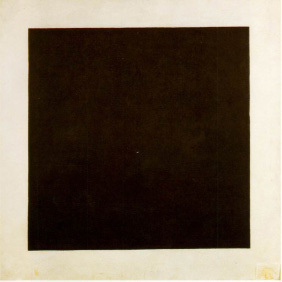 This led to the trend for full abstraction, in which realistic shapes and figures were eschewed from the picture frame in favour of block shapes, lines, colour splashes and – in the case of an artist like Kazimir Malevich – black squares. Whether or not you’re a fan of figurative art that champions traditional linear perspective, it’s interesting to consider how your opinion of a piece of art can be changed by how much depth, space and perspective is on display. To explore this notion, try checking out some Byzantine or Medieval art of the 13th and 14th centuries, before shading and vanishing points existed. If you’ve been inspired by any of the paintings in this article, and you’re looking to bring some art into your home, head to our Picture Frames & Mounts page. Here you’ll be able to enter the exact dimensions of your chosen image (whether it’s by Giotto or Picasso), select a mount and order the perfect picture frame. Posted by easyframe on 9th August 2017 at 1:41 pm in Blog Posts.